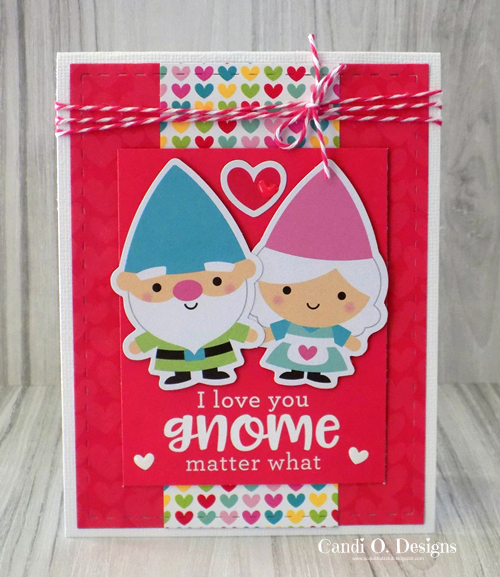 We love nothing better than spotting Doodlebug creations being made by 'You' so we thought it might be nice to share some of those wonderful projects with everyone. 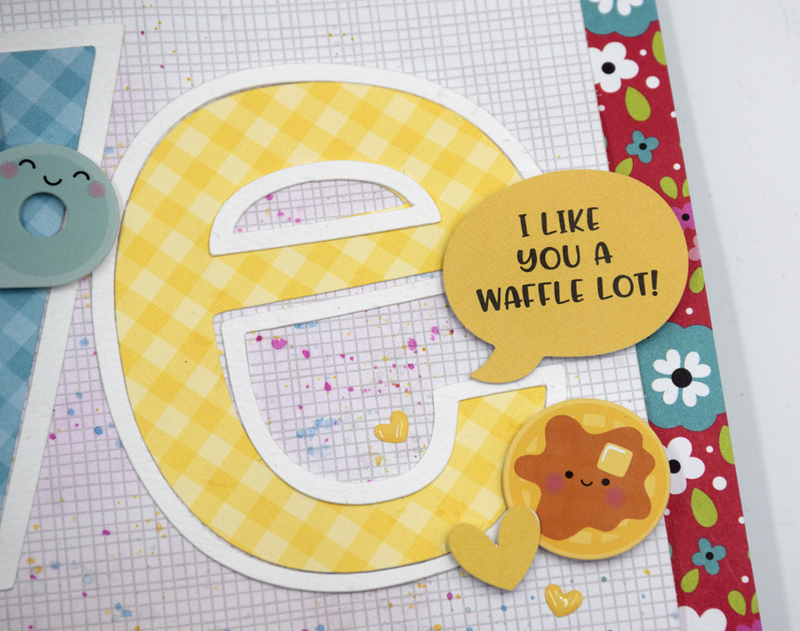 We think Becky's layout using So Punny is the sweetest design and we love how she has used the 'Waffley Cute' paper behind her heart cut file. 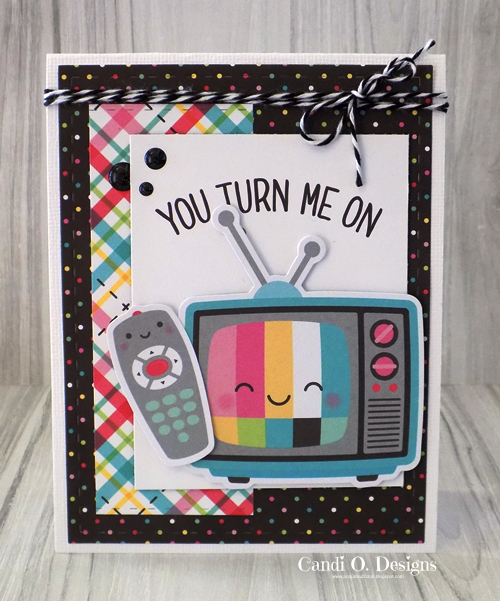 So Punny really is a card maker's dream collection because we have matched all the Odds & Ends Icons with their very own punny Chit Chat pieces. 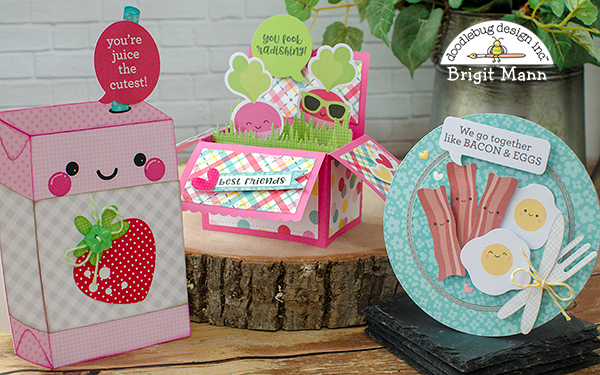 And we think these two cards by Candi O Designs are simply adorable. Oh my, how these little eggs pop right off the page with the use of a black background. 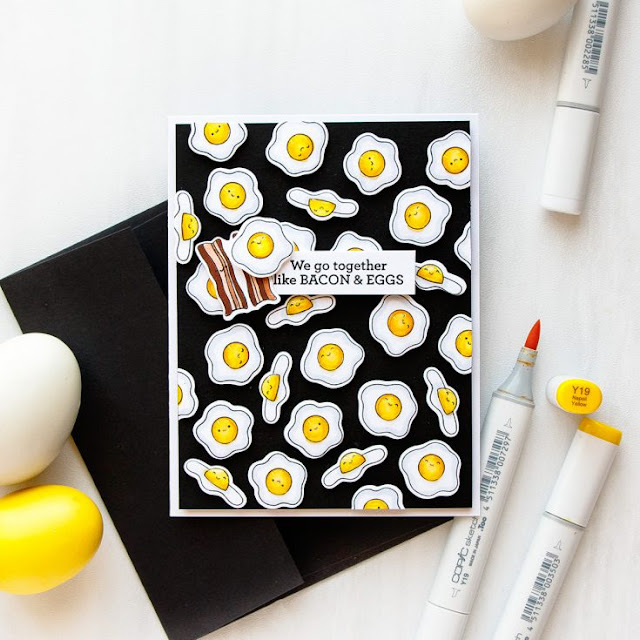 Yana has created this clever design by stamping and coloring multiple eggs and adhering them using pop dots for extra dimension on her card. 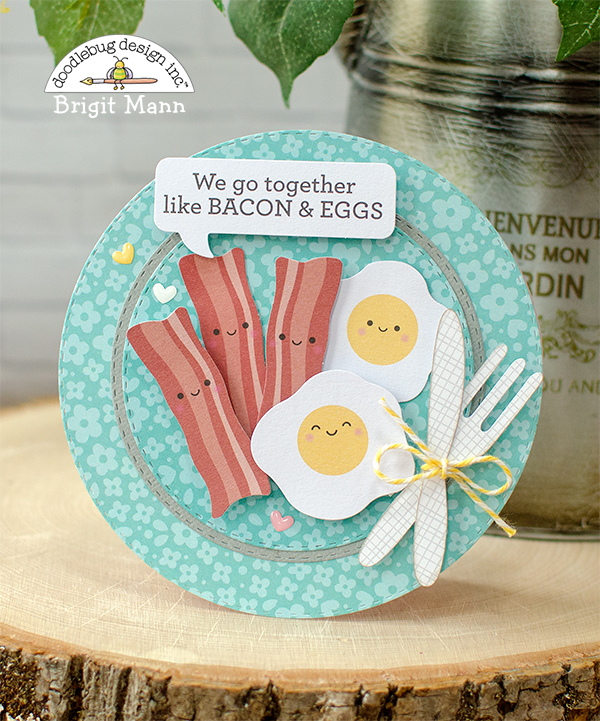 The Stamp Collection is called Breakfast Buddies by Simon Says Stamp who work with our icons to create amazing exclusive stamp sets. This layout popped right out at us with its bright colors and super fun theme, not to mention the incredibly cute photo. Seriously these little treat bags are so adorably sweet and would make perfect gifts for any age and any occasion. Sistang has created a wonderful video sharing how she put together these little bags so we thought we'd share because 'Sharing is Caring'. I started with a piece of I'm Daisy for you paper for the background. I chose a piece of lily white Gingham/Linen Petite Print paper to build on. I did a little mixed media on the paper with some light pink water colors and then some water color paint splatters in pink, yellow and aqua. I like adding a subtle bit of color with my watercolors to liven up a plain white background. I chose a fun font called The Open Letter font that I purchase here and then uploaded the font into my Silhouette program. I cut out holes in the letter "O's" and placed 2 photos behind the cut out. I then cut the individual letter outlines out with some white cardstock and then the inside of the letters were cut out with various colors of the Gingham/Linen paper. I glued the letters to the front of the paper. To finish the layout off I added a couple of banners from the Chit Chat die cuts to the top of the page and then a black polka dot ric rac sticker and a strip of hearts from the Heart Deco border paper. 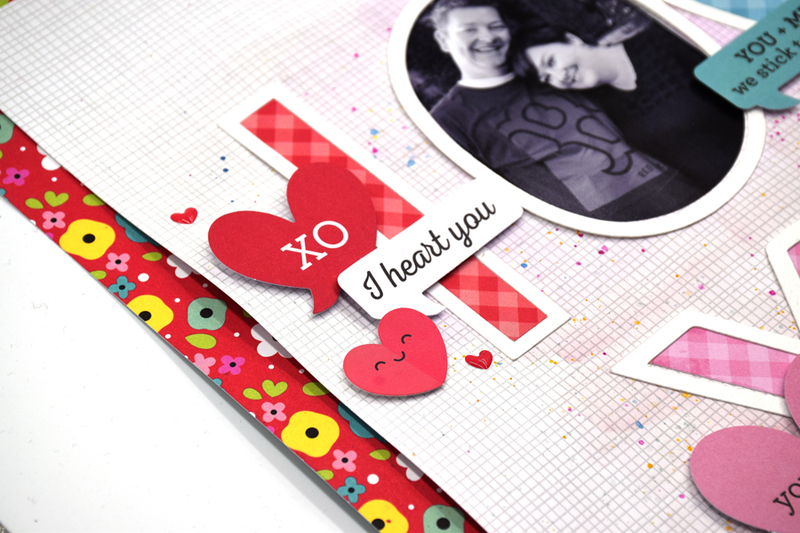 I also added a few Tiny Heart Sprinkle enamel hearts here and there for some added decoration. Thank you for stopping by today! 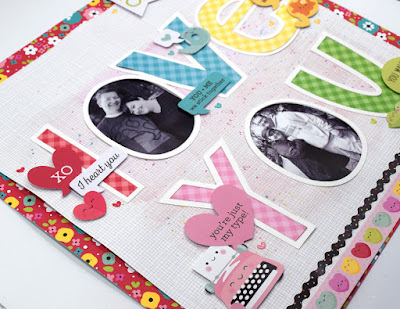 I hope I have inspired you to use up all of those Chit Chat pieces on a layout featuring your special someone! 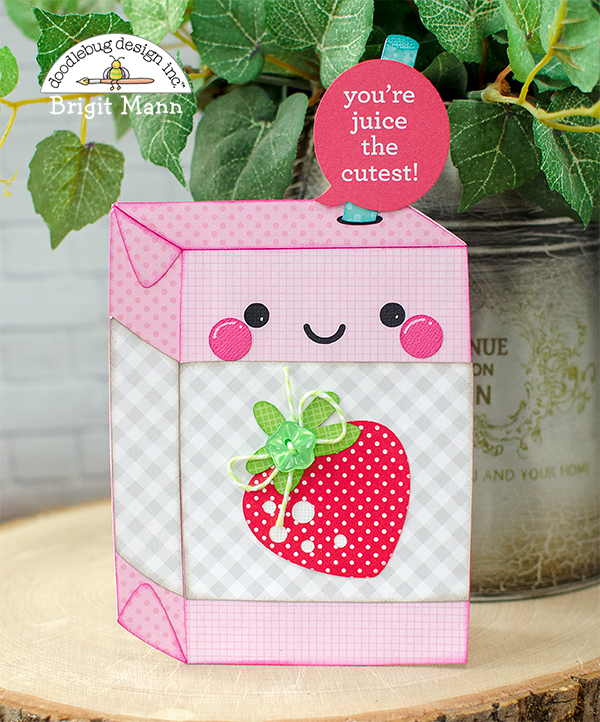 With so many different pieces to chose from in the package of die cuts - you will be able to create oodles of fun projects with the Chit Chat die cuts! Happy Crafting friends! ...or even a fun general purpose card for the tea fan in your life. And really, this is a just a sample of the huge variety in this awesome and versatile collection. The only thing I love more than giving away a homemade card is giving away a homemade card that includes a pun! 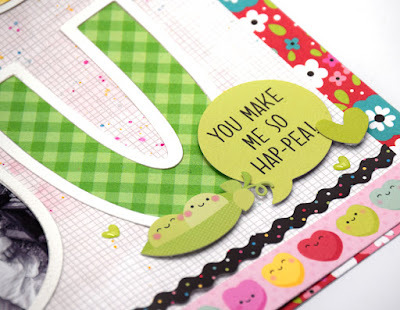 Doodlebug's new Chit Chat die cuts make pulling together a cute card with a great sentiment as easy as it gets! 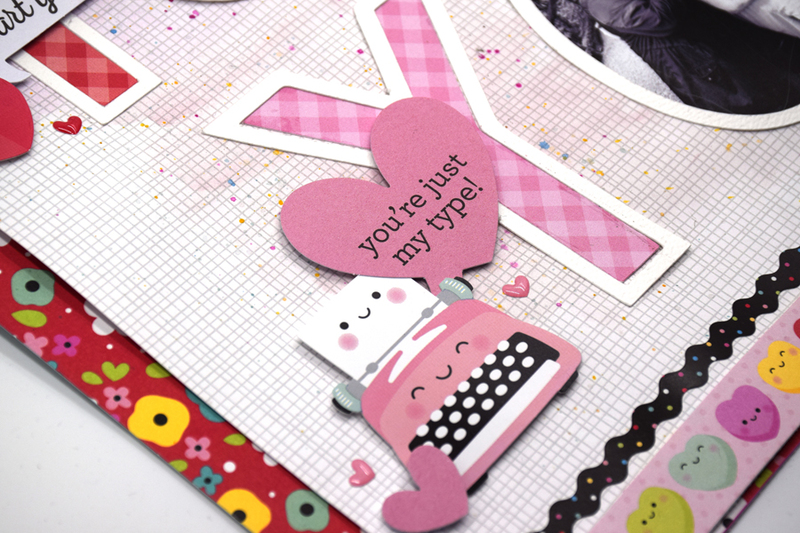 And given the huge amount of sentiments that come is a package, you'll have no shortage of cards to give away! 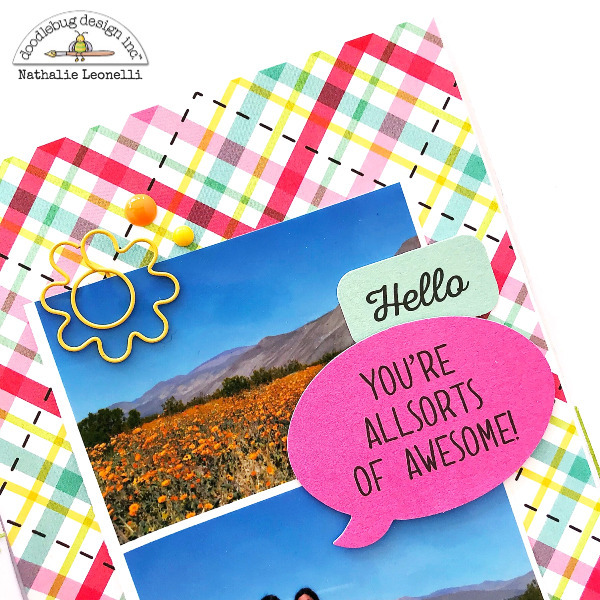 I hope you've enjoyed these cards, thanks for stopping by and have a wonderful day! Hello, Doodlebug friends. I hope you have all been enjoying the wonderful Chit Chat projects the team has been sharing. 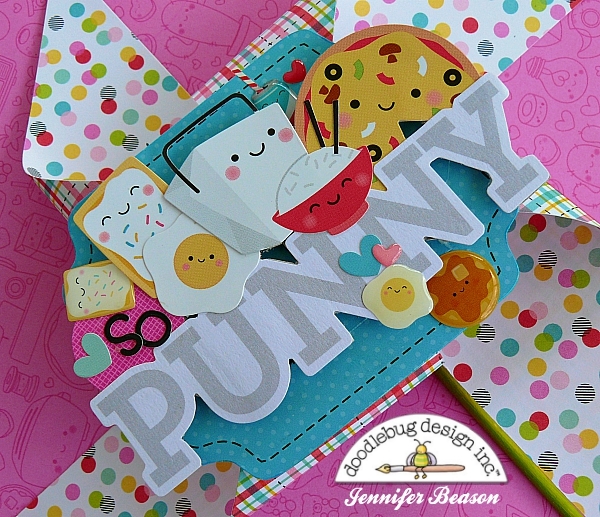 I originally had a different project in mind but after a short hospital stay, I was inspired to create a "Get Well Soon" gift using the So Punny collection. Here's what I came up with. 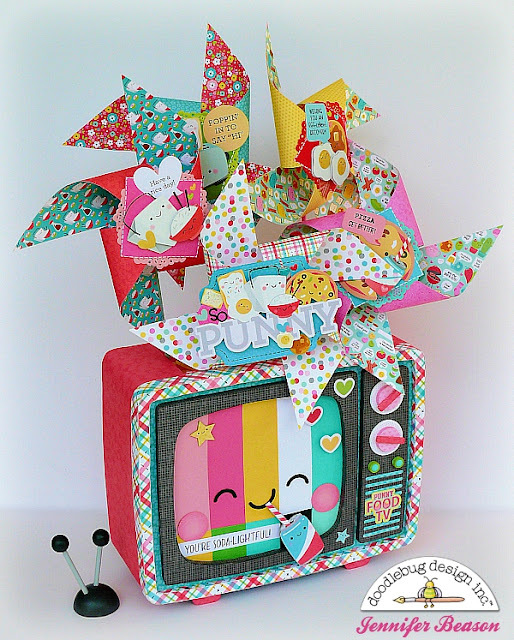 I'm hoping this fun TV and oversized bouquet of pinwheels will lift someone's spirits and show them how much they are loved. I used a few puns from the Chit Chat set and also made two more to go along with the "get well" theme. 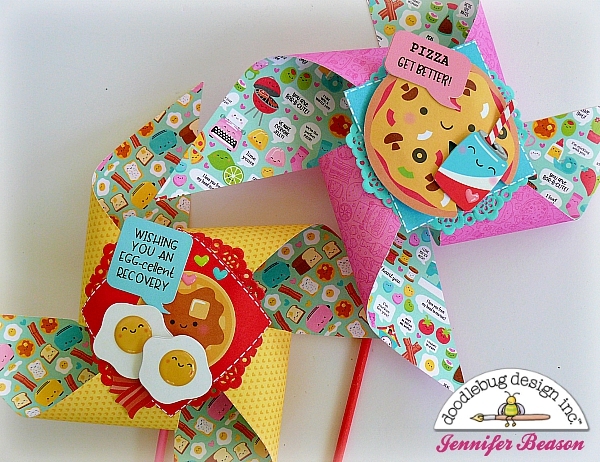 For the last pinwheel, I used the "punny" die cut, also from the set, and added coordinating stickers, doodle pops, and food shaped sprinkles. The television is a So Punny cutting file. Two silhouettes of the TV were cut out of thin chipboard using my Silhouette machine, then mounted to foam board. I made a foam box to fit in between the two, then the sides were closed up using chipboard. 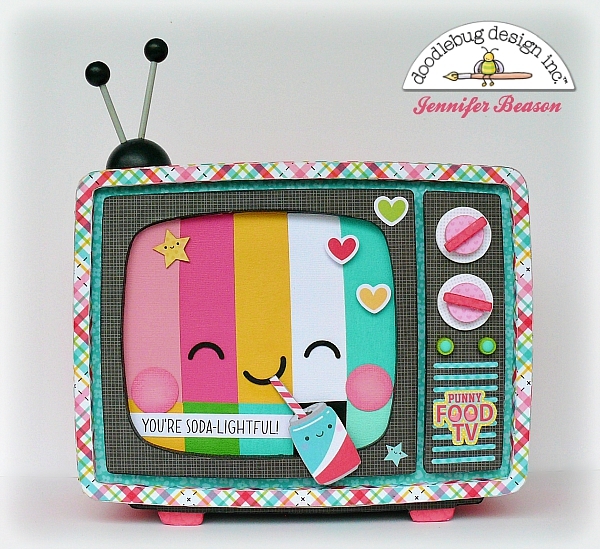 Once the tv box was made I covered it with patterned paper and cardstock. 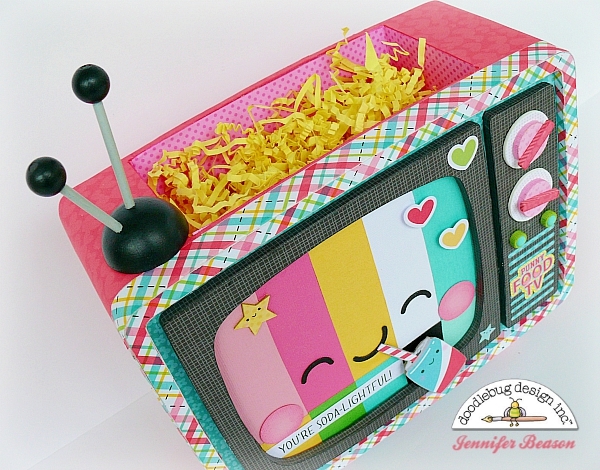 To give the box more dimension, the knobs, screen border and tv border were cut out of layers of chipboard or foam board. 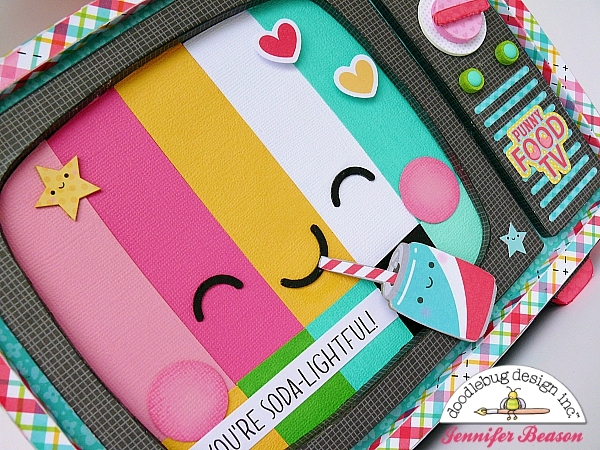 Here you can see the Soda-lightful Chit Chat close up and of course, I had to give the tv a soda from the odds and ends pack, to drink. The back of the box is very simple, just a few heart die cuts. I really wanted to attach the antenna, but with all the pinwheels I couldn't decide on the placement. I decided not to glue it down, but make it an accessory. 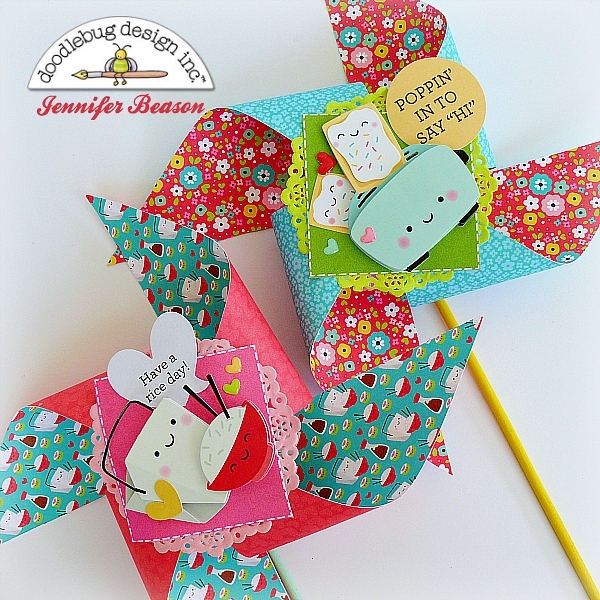 Once the recipient is feeling better the pinwheels can be removed and the box could be used for storage or as decor. Thanks so much for joining me today. Happy crafting everyone! 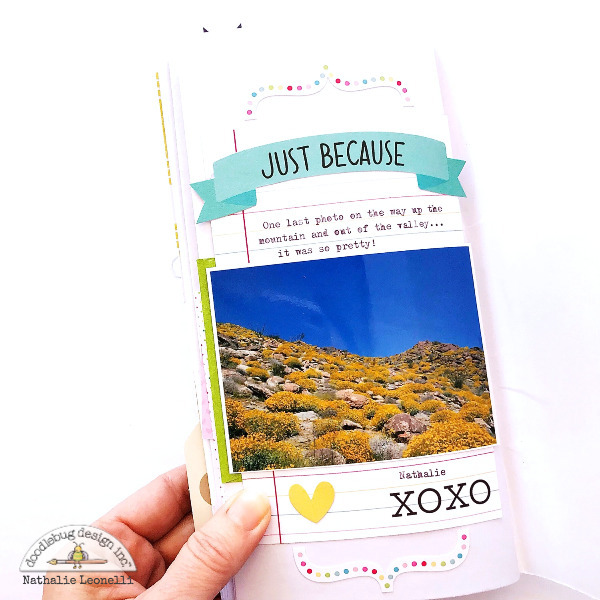 I have been documenting a day trip to the desert in a traveler's notebook insert for a bit and I used the So Punny collection to finish the last two pages. My goal here was to use the Chit Chat elements for a non-Valentine's project, showing you how versatile they are. I first cut a piece of 12x12 Plaid paper to the size of my right page. 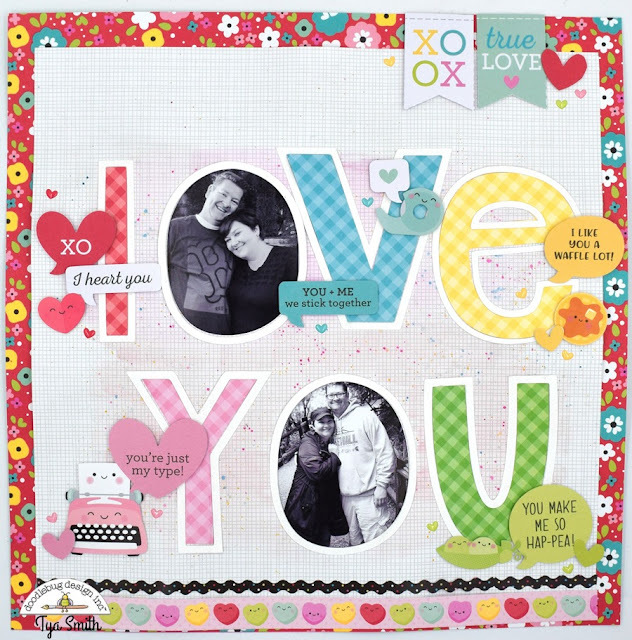 After placing my photo strip, I added two speech bubbles from the Chit Chat pack adhering the bigger one with foam dots for dimension. 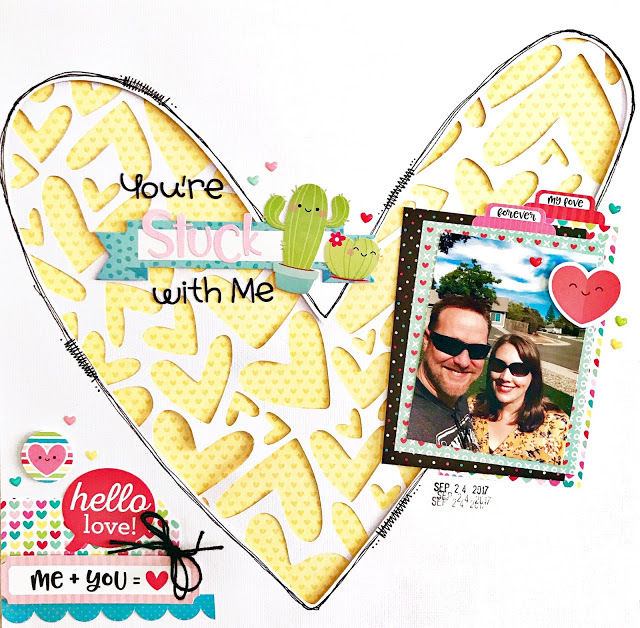 For the left side, I really wanted to use the big Love arrow diecut (also from the Chit Chat pack) and found a couple of papers in the So Punny 6x6 paper pad to add layers under my photo. The arrow diecut is also on foam dots and brings the eye to the photo. The journaling tucked under the photo is actually done on the scalloped flap of an envelope from the Love assortment of Cards & Envelopes (I used the rest of the envelope on my next page). 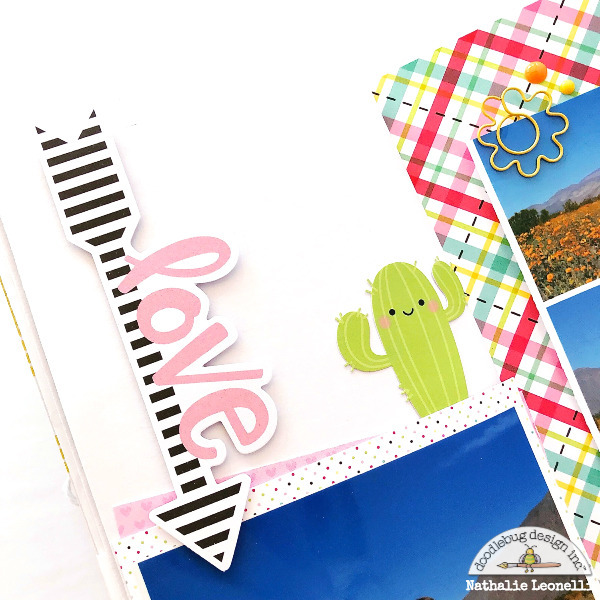 Since this is about a trip to the desert, I chose to add a couple of cactus stickers from the Icons sticker sheet. They just make me smile. 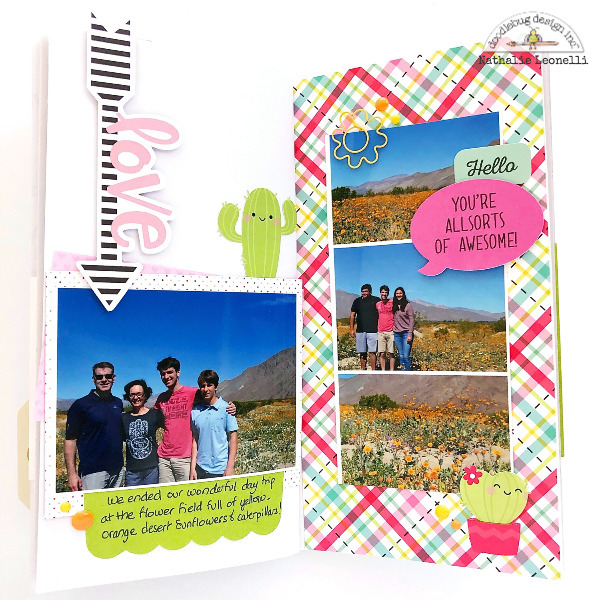 I finished off the spread with a cute flower clip and assorted enamel dots. The next page was the last page of my book so I couldn't stop here! I fed a piece of the Work of Heart paper into my typewriter to write the last lines. I liked the notebook piece that was already signed XOXO. 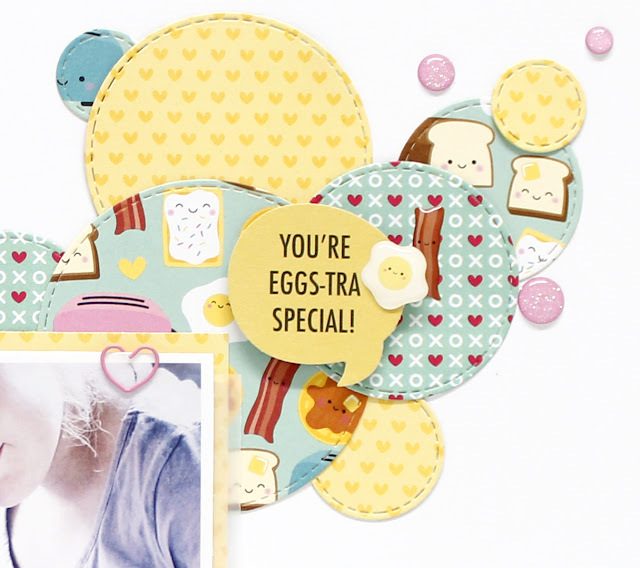 I selected two more diecuts from my Chit Chat pack, the banner to use as a title and a yellow heart. Feeling like it still needed something, I framed my page with bracket stickers from the This & That sticker sheet. I like how they add just a touch of color. 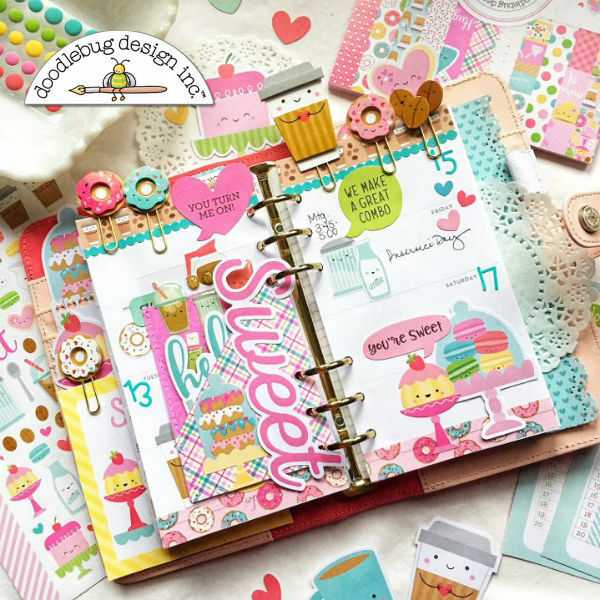 I just love working in this format and I am so very excited about the upcoming Doodlebug Design Daily Doodles Traveler's Notebooks and inserts! I can not wait! Do you get excited about an awesome tasting breakfast? We love having a family breakfast together on the weekends. I captured my daughter one morning after she had made a bacon, egg and pancake sandwich and she was pretty pleased with herself because it was going to taste amazing!! 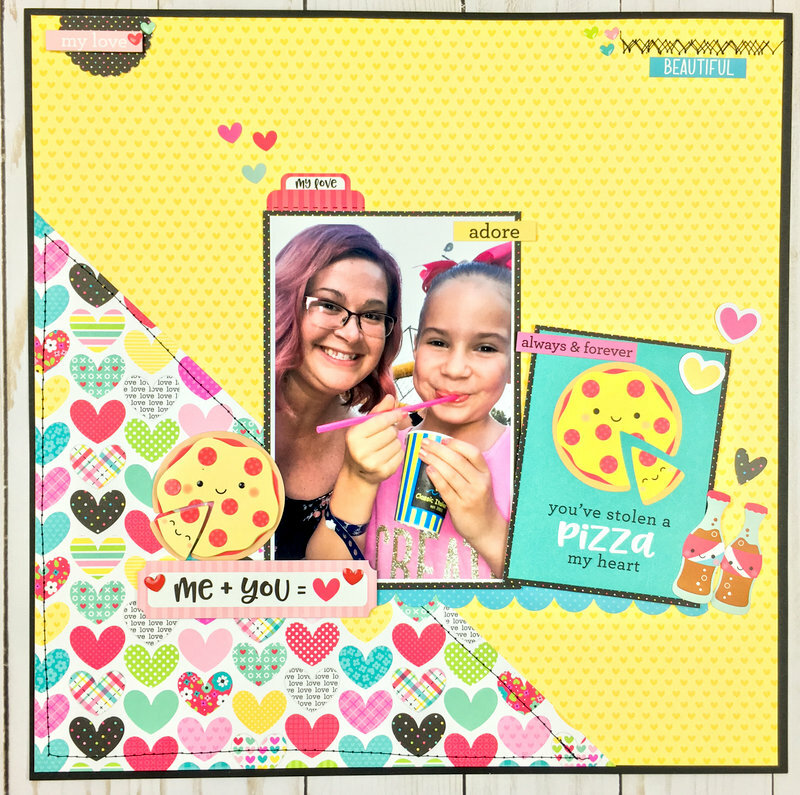 It’s chitchat week so I’m sharing a layout using those awesome chitchat pieces on my layout. then started to add the chit chat bits around my layout. 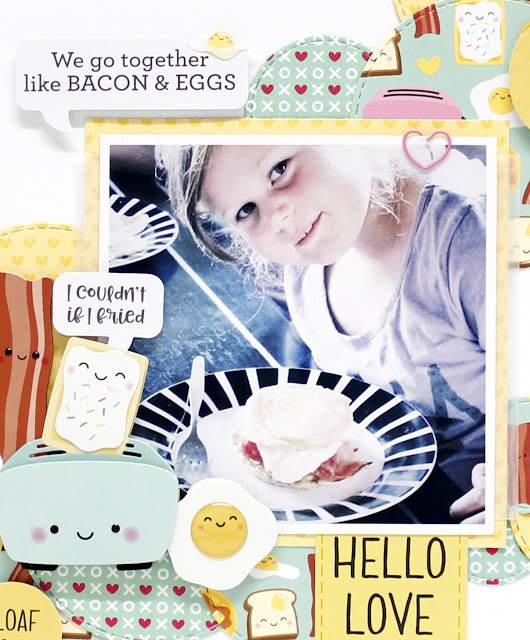 Next I added some of those cute doodle-pops (bacon and eggs and toaster time) to the corner of my photo. 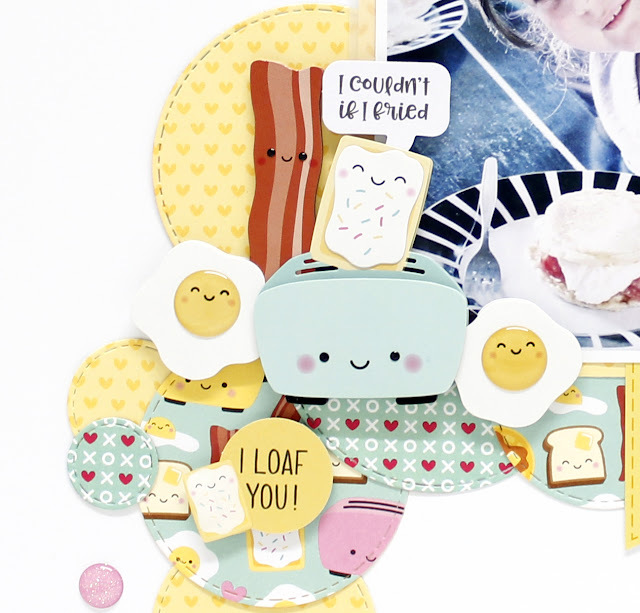 (Breakfast buddies shape sprinkles) and added them around the layout. 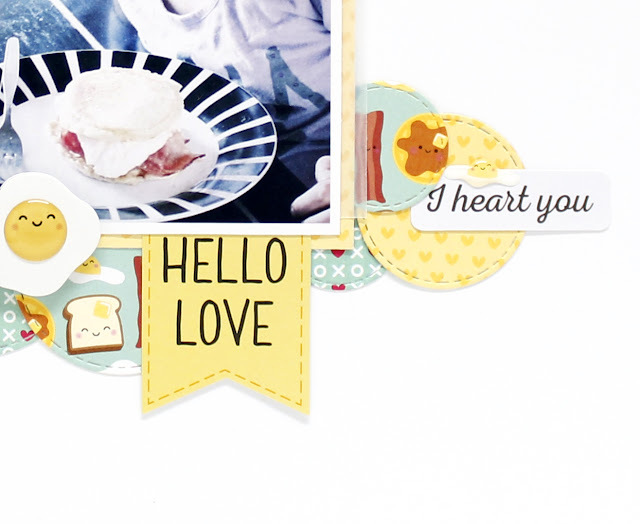 I used another chit chat bit for my title and a cute mini heart paper clip at the top of my photo. And to finish it off I added some pink glitter shape sprinkles to the top and bottom of my layout. And if you want to watch my create my layout check out my process video. from people wanting to know how Anabelle put together the little paper clips using the So Punny icons. Anabelle has been so kind to take a few photos and add a blurb explaining her process. We're sure this will help answer your questions. Scroll to the bottom of this post to find the new information. 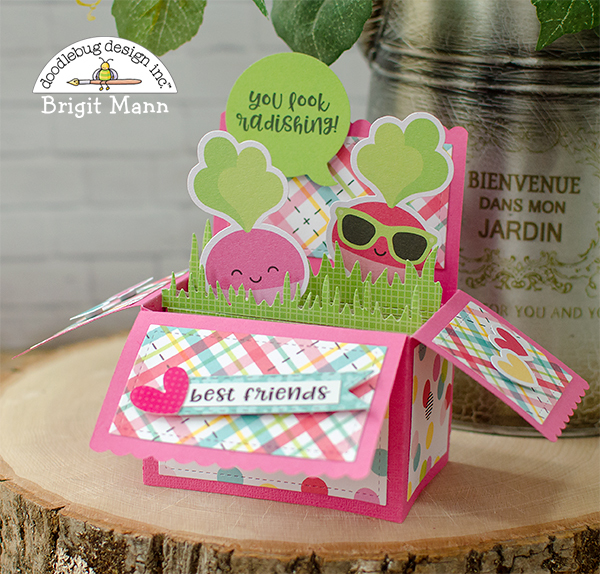 There are many fun ways to use the So Punny Chit Chats on projects. They are paired so perfectly with the cute little characters in the line. But, they aren't just limited to that line. 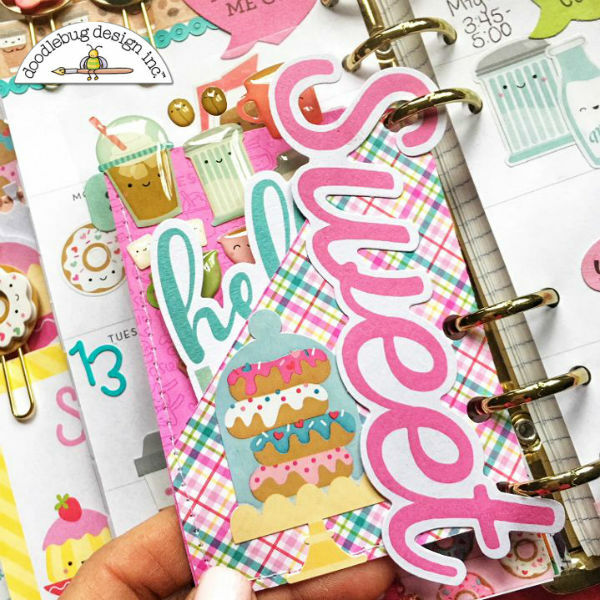 I decided to create my weekly planner spread using the Cream and Sugar collection. 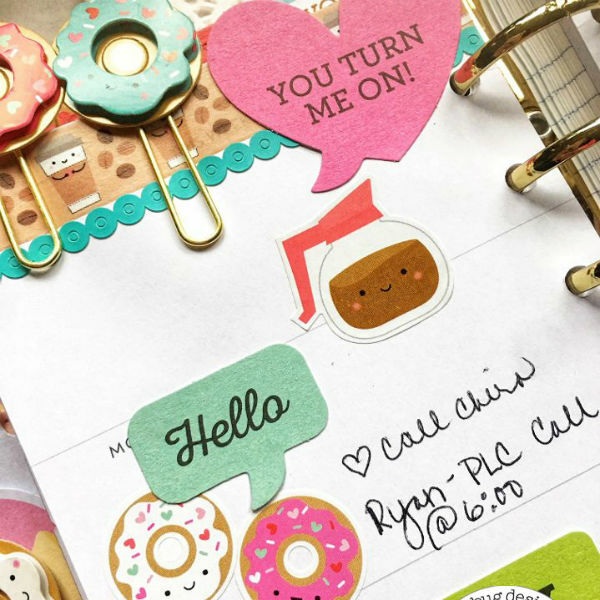 I seriously can't get enough of the cute coffee and donuts motifs and wanted to mix the Chit Chats with them. It worked perfectly! The little sayings worked wonderfully with the characters from this collection, as well. Here is the result. 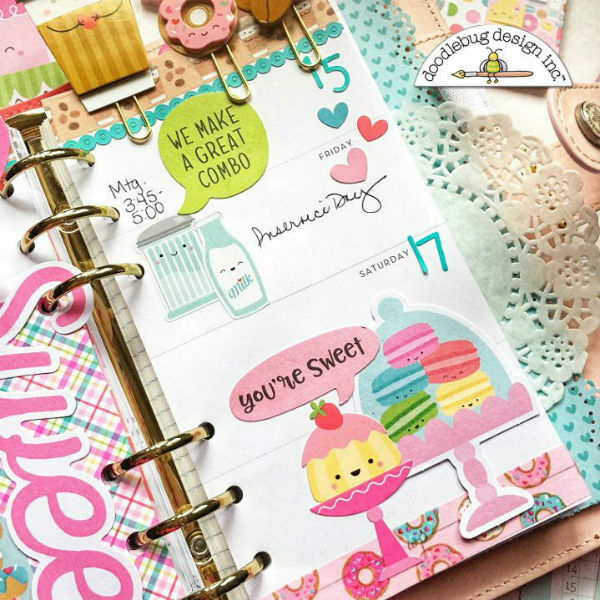 I love the coffee and donut washi tapes, so I had to incorporate them into my layout. 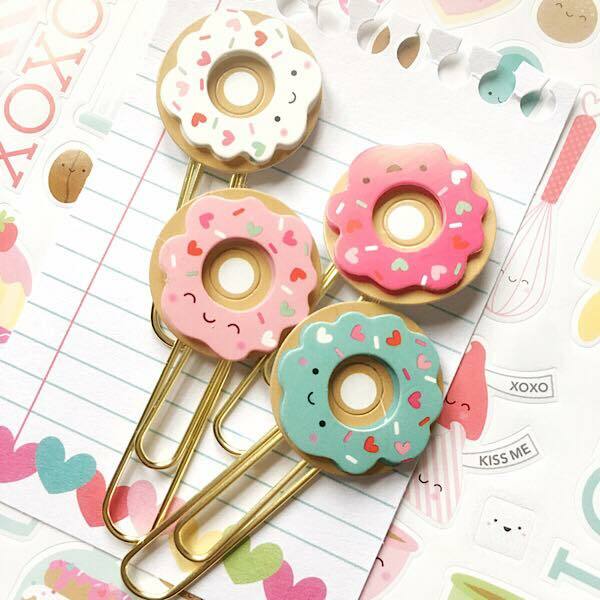 I was able to use the Doodlepop clips I had made a while back, too. I made this pocket to add to my spread. I absolutely love the plaid paper so I had to use it for that. Since my theme was rather 'sweet' this week, I added the large 'SWEET' chit chat to the pocket. I tucked some stickers and another chit chat inside of it. As you can see, the little characters from the Cream and Sugar line were a perfect match for the speech bubbles. The coffee and tea were made for this adorable chit chat, don't you think? And I love the coffee pot saying 'You turn me on." Really, these worked just perfectly with the collection! While these were released as a Valentine's Day collection, they certainly can be used for so much more. I just loved pairing them with Cream and Sugar! Thanks for stopping by and have a great day! 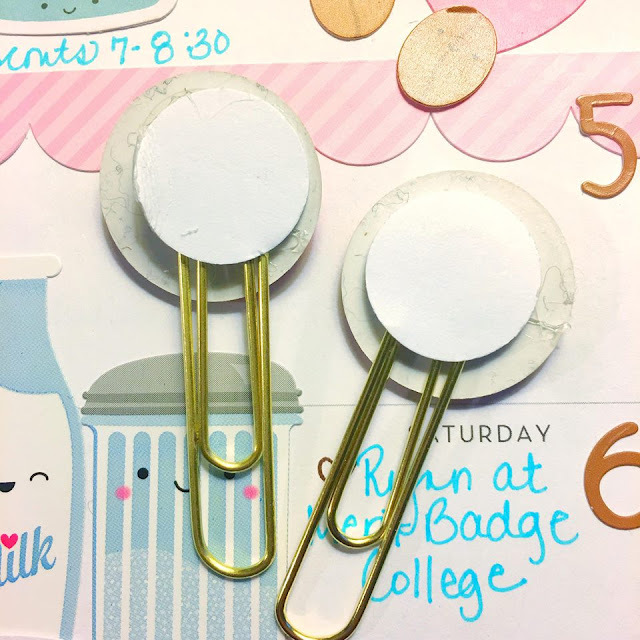 Making planner clips with Doodle Pops is easy and fun. It’s my favorite thing to do with them. All you need to do is hot glue the sticker to a paperclip. Then punch a round circle from card stock with a circle punch and adhere it to the back of the sticker to finish things off. Give it about 10 seconds to cool off and you are ready to go!